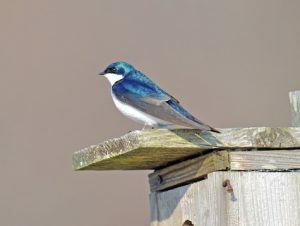 ” Handsome aerialists with deep-blue iridescent backs and clean white fronts, Tree Swallows are a familiar sight in summer fields and wetlands across northern North America. They chase after flying insects with acrobatic twists and turns, their steely blue-green feathers flashing in the sunlight. 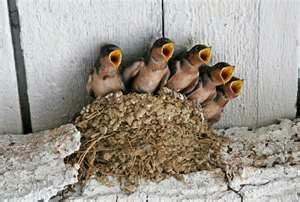 Tree Swallows nest in tree cavities; they also readily take up residence in nest boxes ” From Allaboutbirds.org. 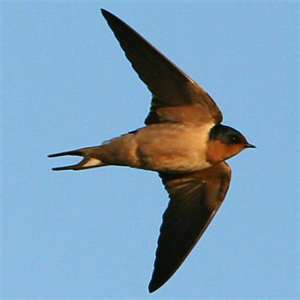 You can go to this website and hear sounds from tree swallows and read more about this specifies. Barn Swallows (sometimes called mud swallows) are similar in look but different coloring. “Glistening cobalt blue above and tawny below, Barn Swallows dart gracefully over fields, barnyards, and open water in search of flying insect prey. Look for the long, deeply forked tail that streams out behind this agile flyer and sets it apart from all other North American swallows. ” From allaboutbirds.org. The difficulty with Barn Swallows is that they love to build mud nests on porches and patios – anything with the slightest ledge is attractive to them. The nests are amazingly built but they are VERY messy. The nests get built, the eggs get laid and then the bird droppings appear and it gets bad from there. 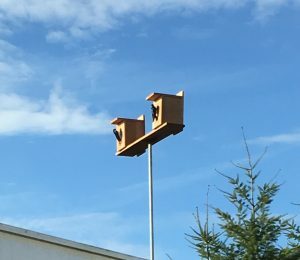 We ask residents to let us know if they see this nest building on houses (particularly houses under construction) or apartments so that we can remove before the eggs get laid. Sometimes you have to remove the nest several times before the birds get the idea but we definitely want to do this sooner rather than later because once the eggs are in the nest we don’t remove them. Oh so cute Barn Swallow babies! The bee part of this conversation is coming very soon, especially with all the sunny days we have had. Soon the queen bees will be hunting for spots to start nests in porches, patios and decks. Honey bees are important for our local gardens so leaving them alone is helpful. Yellow Jackets and Hornets on the other hand are pests. Call the office if you have nests to be removed. The earlier the better on these as well. 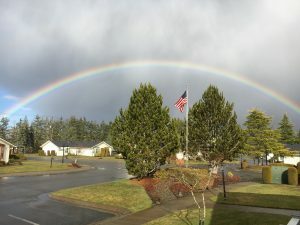 Have a good week enjoying nature here in Stillwaters Estates.